I have feet like Fred Flintsone, short and wide, and so I favour sock patterns with strong vertical lines that (I believe) make my feet look long and slender. These socks have that vertical element, and look fancy while they are actually very simple and fast. The panels of stitches have an arrow pattern created by slipping stitches with the yarn held in front. This is one of my favourite ways of showing off a handpainted yarn, but it doesn't have a lot of stretch, so this use is perfect. 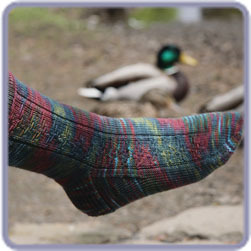 An elegant panel of arrows pointing right at your toes is balanced out by peaceful stockinette on a sock that is just as good for a gentleman or a lady. Note: Our pattern download service is not instant. Once your order is processed, a link to this pattern will be waiting for you in the "My Account" section of the website. When that link has appeared, you can get it by following the instructions below. Right now, our system takes 24-48 hours to generate the pattern link(s), so don't panic if it isn't there right away. It will be. Click the "Log In" link in the upper left corner and sign into your bluemoonfiberarts.com account. Then, click on the "My Account" link (also in the the upper left corner) to see your orders. Click on the "View" button next to your order with the pattern. The pattern can be saved to your computer by clicking the "Download" button. Your pattern link is good for 7 days, but then it will stop working. Check the box for a PDF version of the pattern, otherwise you'll receive a paper version (and be charged shipping).